There's something truly extraordinary about the Aloha Classic at Ho'okipa: it delivers, every year, every time, and it delivers big. Today it delivered huge. 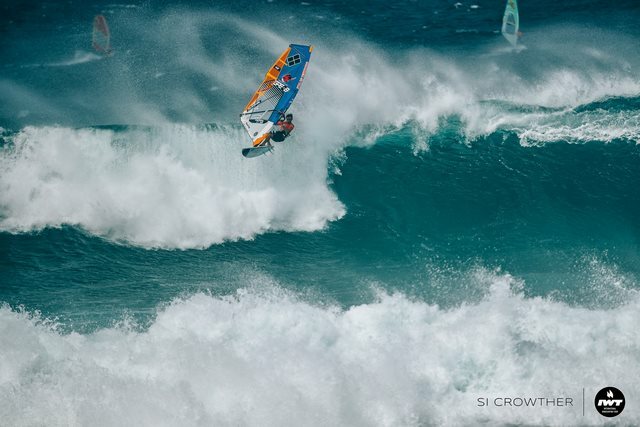 Mast-high waves were forecast and the whole windsurfing world was excited, tuning into the live stream from all corners of planet earth, expecting a terrific opening day—and it was even more extraordinary than forecast. There were 18+ foot faces with 20 to 25 knot cross offshore conditions. It was the absolute best day of the still young winter season, and it was delivered on the opening day of the biggest wave riding contest in the world. Truly extraordinary! With such exceptional conditions, head judge Duncan Coombs called the Pro Men up for the first round of heats. A 48-man bracket was full and we kicked off with round one: 16 x 3-man heats. The seeding is always tricky in big wave events, but it must have been just about perfect because all the highest ranked riders comfortably won their heats and progressed through to the top 32 of round three. All riders who came second or third in round one today progress to round two for their second chance to crack into the prestigious top 32 professional wave riders of the Aloha Classic. Outstanding performances from round one came from seasoned pros! 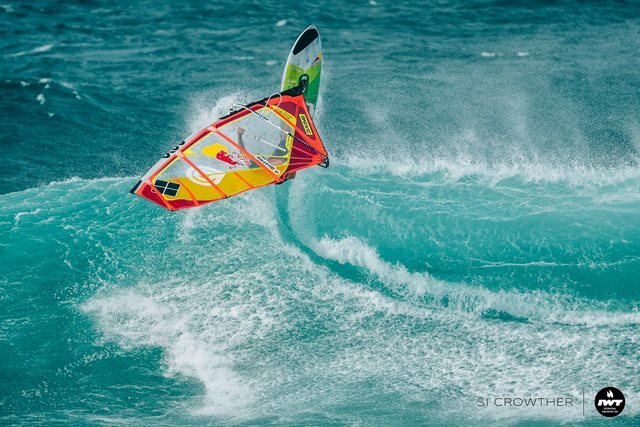 Marcilo Browne (5th overall PWA this year) had a monster wave with three super vertical and critical hits with clean and tweaked aerials to dominate his first round heat. 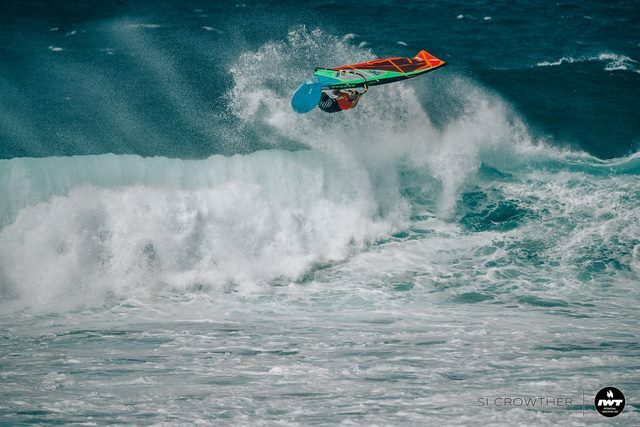 Bernd Roediger (two-time Aloha Classic winner and last year's runner-up) was the stand out rider of the day with huge 9.5 wave scores from hitting massive 18-foot face lips and flying 360 aerial maneuvers that landed at speed and flowed directly into his next bottom to top hits. He was on fire, and today he was certainly the man to beat. 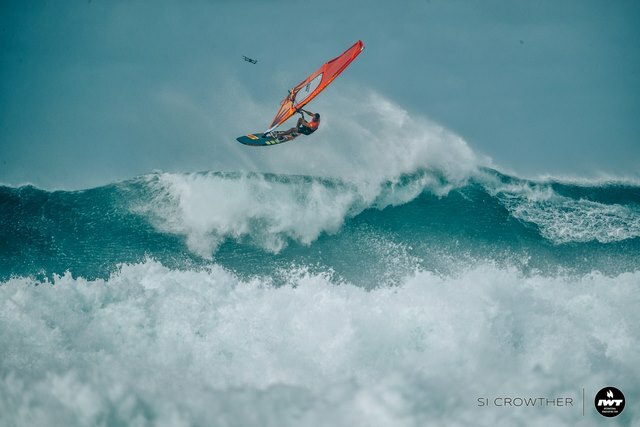 Robby Swift (9th overall PWA this year) went into today with a worrying knee injury but it didn't stop him from taking a series of monster waves in his heat and putting on a world class display of power surfing with full lay down bottom turns and savage gouging top turns throwing huge plumes of snow. 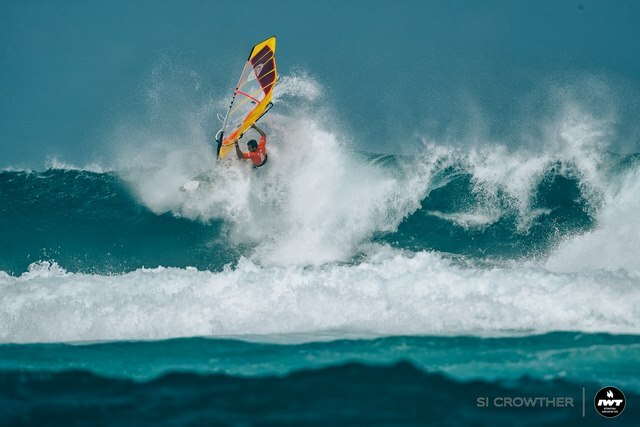 Levi Siver (past Aloha Classic champion) is a Ho'okipa specialist, spending time as a youth on Maui. He has been a sensation since he was 15. He is still regarded as one of the most dangerous guys at Ho'okipa and he turned on an incredible display of power moves today, making the conditions look far easier than they were as he smashed huge lips on monster set wave after set wave. Another one to watch for the top spot in this year's contest. Last year's winner and three-time Aloha Classic Champion, Morgan Noireaux, won his heat but wasn't pushing it too hard. He's a dark horse. The three-time winner is never in a rush in his early heats but rest assured, as the pressure builds progressing toward the finals, this young man knows how to rise to the occasion. 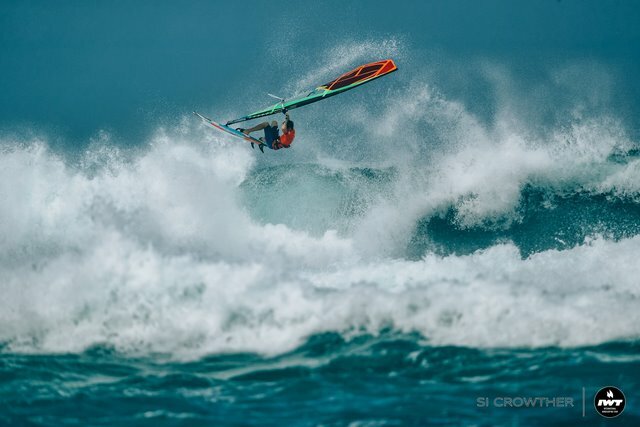 Could this be the year he wins a fourth unprecedented Aloha Classic title? At the conclusion of the first round of Pro Men, the contest shifted to the Pro Women. The waves were now even bigger. The swell had shifted very slightly and the tide was now conspiring to create a far more dangerous situation for riders. The big sets were now closing out the whole of Ho'okipa bay, and if riders were caught on the inside they were very likely to be having a most unwelcome conversation with the world-renowned rocks of Ho'okipa point. The first heat in round one for the women saw past world champion and previous multiple-time Aloha Classic Champion, Angela Cochran, lay down a serious master class in how to handle a massive day here. She flew out through the technical and dangerous waves ride after ride. She went high and deep and showed no fear as she charged the lips of the monsters rolling into the bay. It was a powerful display, and she completely dominated the heat despite her younger and also very talented rival and IWT 2018 champion, Maria Andres, catching some great waves. Just goes to show that true grit never gets old. 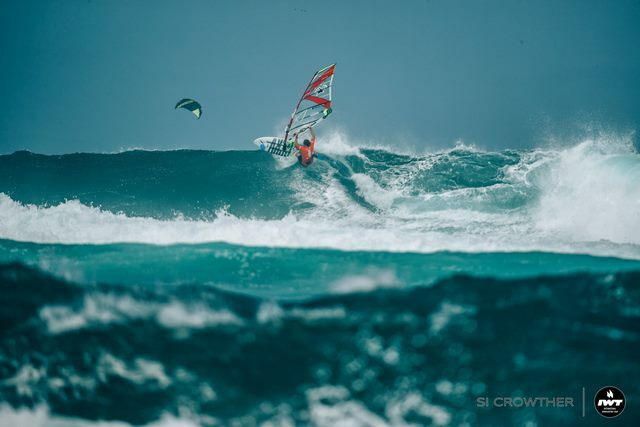 The second heat of the women saw another past Aloha Classic Champion, Motoko Sato from Japan, ride powerfully to claim the top spot and sail through to round three and the semi-finals, ahead of Sabine Zola from Italy, who also charged some great lines. In the third heat, the conditions seemed to get even more critical. Every second set wave was now a full 18+ foot wall of power that closed out the bay. It was now a major challenge just to get out the back into position to catch a wave. Canadian and now long-time local, Shawna Cropus, showed her big wave experience and made it look easy as she caught and rode one monster after another. 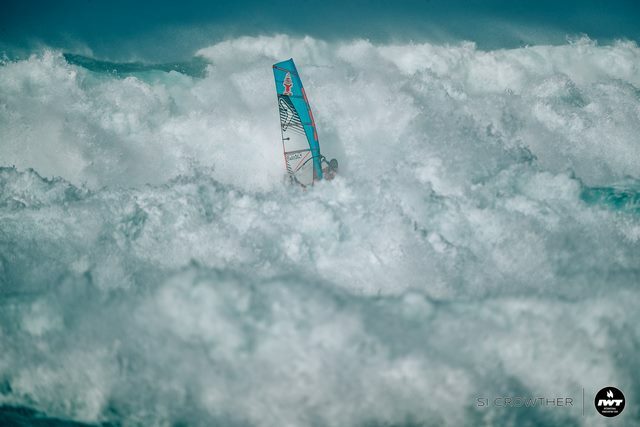 Annamaria Zollet from Italy managed to get out the back once and ride a nice big wave, but she was then stuck in the inside, unable to break through the relentless walls of mast-high white water. 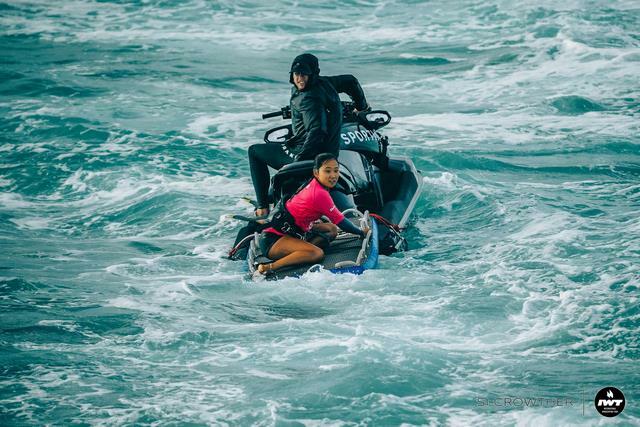 She was eventually separated from her equipment and picked up by big wave surf ski rescue legends the Walsh brothers. Her equipment wasn't so lucky. It was dashed against the rocks and the remnants dragged out by a very busy shore crew. The fourth and final heat of the first round of women saw hot favorite and last year's Aloha Classic Champion, Sarah Hauser up against young Japanese rider, Kazuki Ishihara. Kazuki showed impressive skill and terrific tenacity and bravery to charge out into this raging ocean with far less experience than others in this stellar field. As impressive as her efforts were, she was no match for the in-form Hauser, who was carving her way across mountainous faces again and again to rack up a powerful lead that shot her through to round three with the other winners of the day. All in all, it was a hugely impressive day of sailing in utterly extraordinary conditions. Tomorrow's forecast is for slightly smaller swell and it seems likely that competition will continue with the Pro Men and Women if conditions hold. After the high drama of huge waves and rock rescues, the IWT family gathered on the clean sand under a setting sun sky to farewell one of their own. Mike Colee had been coming to AWT and IWT events for many years as a Master and recently as a Grand Master. He was everything that we all aspire to be: a great sailor, an adventurer, a friend, a supporter of all, and a man with much love and aloha in his life that he shared with us all. Rest in Peace Mike. Until the next swell. Tomorrow.